Look closely, tell me what you see (two people or three). *Wow, Mr. Photographer, judging from these remarkable photos, if this is your first time doing this, you’re pretty darn bad … and that’s good. A woman nearing the end of her nine-month pregnancy did what has to be the most loving thing a wife can do. According to a report in The Daily Mail , when Nicole Bennett unexpectedly lost her husband, Deonta, a few weeks back, she decided to move forward with an idea he had. To take family maternity photos. 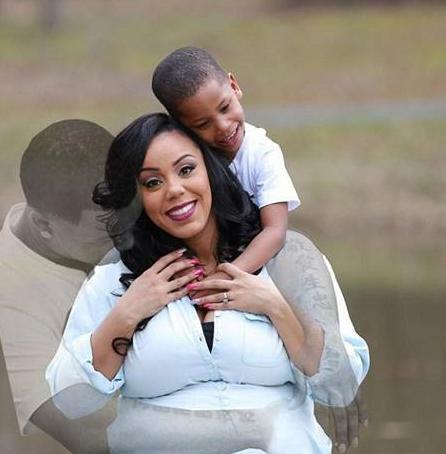 Bennett, who is expected to deliver on March 25, and her 4-year-son, did have the photo shoot. And thanks to a gifted photographer, daddy was there too. Read more and see the remarkable photos at EURThisNthat. Very sorry for your loss. Stay strong mamma. Oh Jen, I hope you can reach the photographer and have him do the same for you. Thanks so much for weighing in.. I am so very sorry for the loss of your son. Please take good care.